Here at Bullet Garage Doors, we understand how important garage doors are to the overall appearance and security of your home. While the garage door might not be first on your list when it comes to house maintenance, it’s an incredibly important aspect of any property, both from an aesthetic and functional perspective. Aesthetically, garage doors can add the finishing touches to a clean, smart looking home exterior; from a more functional perspective, an effective garage door can act as the first line of defence when it comes to security. We’re based in Dunstable, meaning we’re in the perfect location to provide the areas throughout Bedfordshire with garage doors. We’re under 20 miles away from Stevenage, and can get to you via a simple route along the A505; that means we can continue to service your garage door after it’s been installed. We have a wide range of garage doors available, including overhead canopy, sectional, and automatic styles. All of our doors come from highly reputable brands, such as Hormann and Cardale. Our team can also fit automated systems to current doors, as well as install new garage doors. All of work is accompanied by a 12 month guarantee, giving you the reassurance that everything we do is completed to the highest of standards. Don’t take our word for that though, head over to our testimonials page to see what our previous customers have had to say. As well as fitting new garage doors and tinkering with existing systems, we’re also adept at repairing current units. Our garage door repairs are all available at affordable prices, and we offer no obligation quotes to Stevenage customers. As we’ve said, our location makes it really easy for us to come and see you, so don’t hesitate to contact us if you’re in need of a repair job! All of our engineers are experienced in garage door repairs, and will complete the work efficiently with little to no disruption to your day. Simply let our engineers know the brand of garage door you have, what your requirements are, and we’ll send someone over. 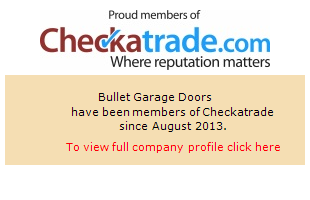 For any garage door repairs, or new garage door installations, get in touch with the team at Bullet Garage Doors. You can give us a call on 01582 932 025, or fill out one of our online contact forms. We look forward to hearing from you! Removed old iron gates and fitted to back of car port to close off opening from the rear. Fitted an electric insulated roller door in anthracite grey and fully boxed to the front to match existing doors and windows.